I hope that you all had a nice weekend. I had a very enjoyable Mother's Day and worked on a project I have been meaning to get to but never seem to find the time to do! 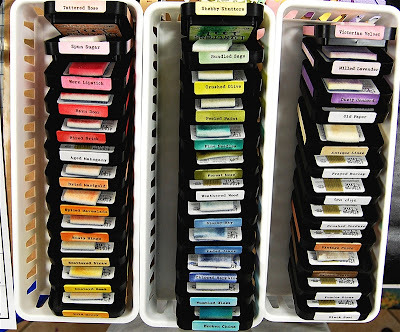 I have been accumulating Tim Holtz Distress Ink Pads and Distress Stains for a while (in part due to some great sales on Blitsy) and I wanted to get everything labelled and organized to make it easy to grab the colors I want when I start a project. 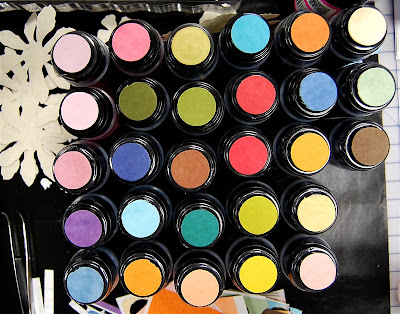 Ranger has lots of free downloads on their site for color charts and ink pad labels. Click HERE to go to the page with the download links. 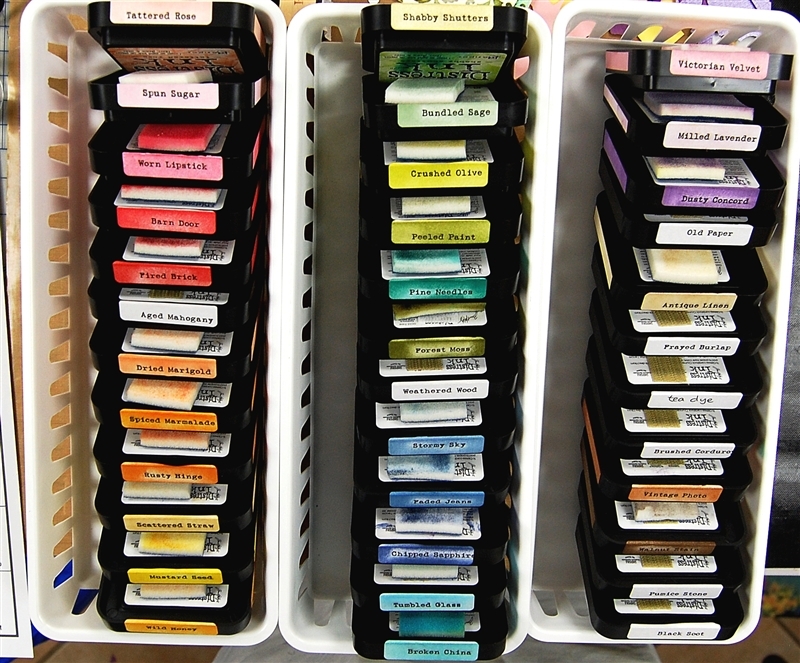 The labels for the ink pads are set up for Avery 5267 labels - or labels that are 80 per sheet and 1 3/4 inch by 1/2 inch in size. I finally got to Staples to buy the labels on Friday so I could set up my system. Here is my nearly completed chart - I ran out of the foam pads for the blending tool so I have to go buy another pack and then I can finish up. When I bought the small labels for the ink pads, I also bought some 2 by 4 inch labels. 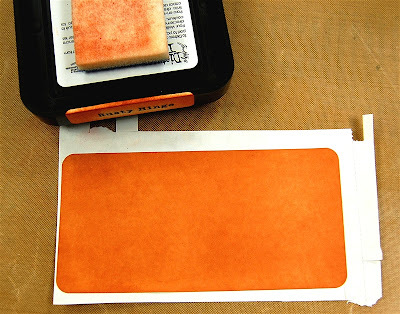 I peeled off a label and placed it on my Non-stick Craft Sheet and then applied ink all over the label directly from the pad. When the label was dry, I lifted it off the Craft Sheet and put it back on the backing paper. 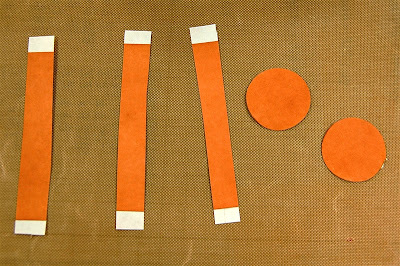 I put a piece of sticky backed velcro (the loopy side) on the back of each ink pad to hold the foam pad for each color. I don't have enough handles for all of the inks so I switch out the foam for each project and keep the foam pad attached to the ink when it is not in use. I attached the labels to the side of the ink pad. I have them on the pads "upside down" so I can read them if I sit the pad on a shelf (the foam stuck to the bottom keeps them from sitting flat when they are right side up). For the darker colors, I leave the part with the name slightly lighter so it is easy to read. I cut three strips, about 1/4 inch wide and punched two 3/4 inch circles from each label. 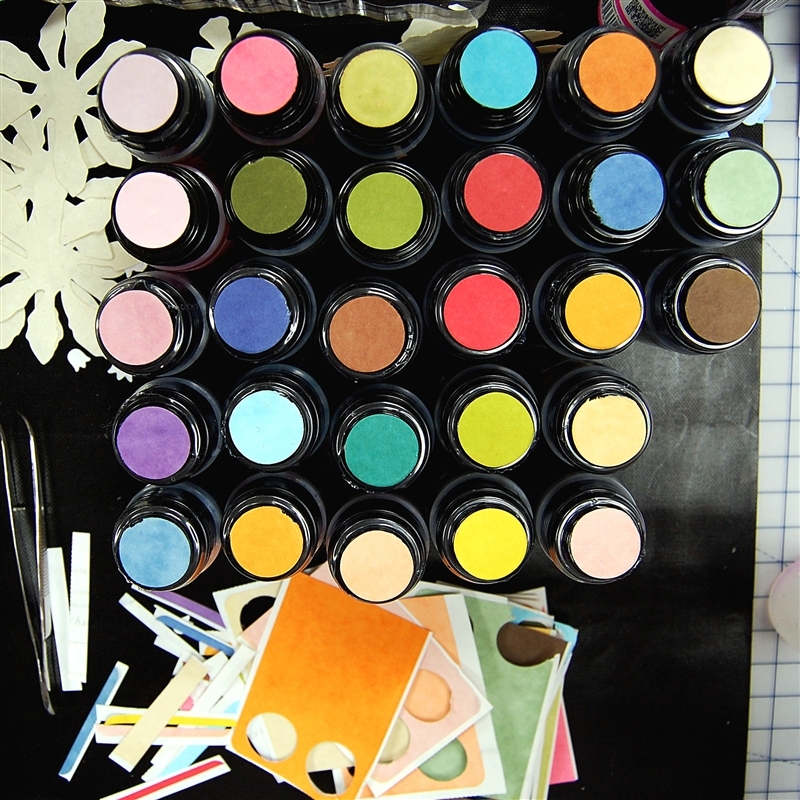 The circles are for the top of the Distress Stain bottle and for the color chart. I put the three strips on the other three sides of the ink pad so I can see the color at a glance no matter which way it is sitting. 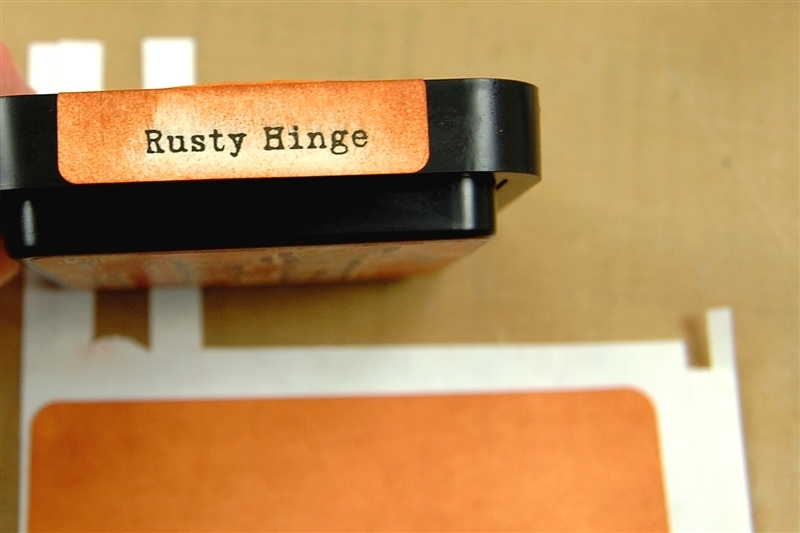 Here is the Rusty Hinge set all finished and ready to store. The dots on the top of the Distress Stain bottles make it much easier to choose the right one. I have been keeping these stored in a drawer and I could only see the black tops so this is a huge help - no more picking up random bottles until I find the right one! I was a little impatient and didn't always allow the inked label to dry long enough. A few times I ended up with circles that didn't punch quite as smoothly as I'd like. I also got some smudges on my chart. I saved the leftover pieces of the labels and I will probably punch out more circles to redo the chart. I'll also punch out a set to use in the Palette lid as a guide when I set up the Reinkers in the Palette. After I got into the swing of things I did four labels at a time. This allowed them to dry a little longer as I worked my way through each set. 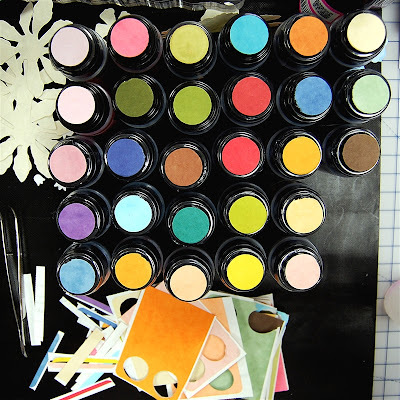 I suppose I could have filled my craft sheet with labels and done a dozen or so at a time but I found it easier to stay organized doing them in groups of four. Our younger son had to work on Mother's Day but he brought me these lilies of the valley (one of my favorites) when he came home Our older son and his wife called from Spain to say Happy Mother's Day. I think the flowers are from all of them! My "big" Mother's Day present is happening next weekend. 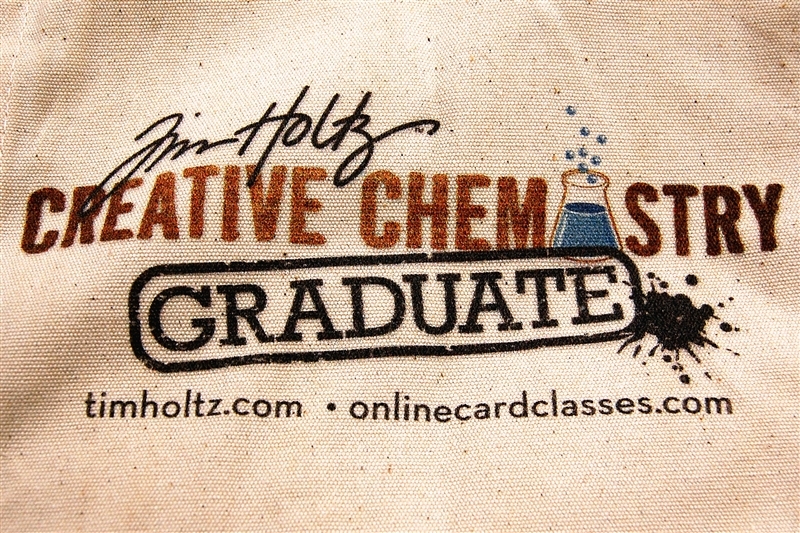 I took the Tim Holtz online class "Creative Chemistry" earlier this year and I have really been enjoying trying something that is very different from my usual computer designing and cutting. I was excited to find out that Tim and Mario would be coming to Massachusetts and, thanks to my husband, I'll be spending next weekend taking classes with Tim at Absolutely Everything in Topsfield, MA. (Special thanks are also due to my friend Marilyn Mae from Maine who stood in line at the store and signed me up since registration opened on the day I was traveling home on a train. We've been "blog friends" for several years and I'll finally get to meet her in person in a few days!). I'll be sure to take some photos of the class and show you the projects that we make in the classes. I think there will be about 90 people in each class. I am amazed that Tim will be able to keep us all organized but I know we will end up with fabulous pieces of art! What a time consuming and product wasting project...wouldn't it be wonderful if the manufacturer did this for all of us? What a shame we as consumers need to invent ideas for storage and usage manufacturers products! Isn't this what and R&D team is for? Congrats on spending the weekend with Tim...I am envious :=)! Please share some tips from this and the online class...I am a loyal follower of your blog. 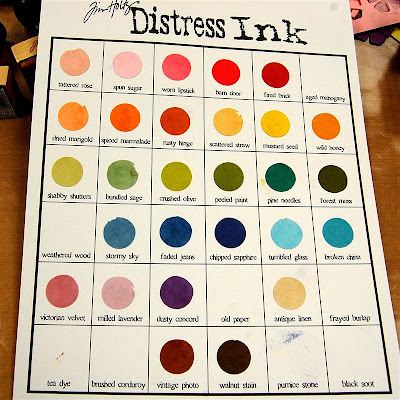 This is a wonderful idea to try, i dont have as many ink pads so that should make it easy to accomplish ;). 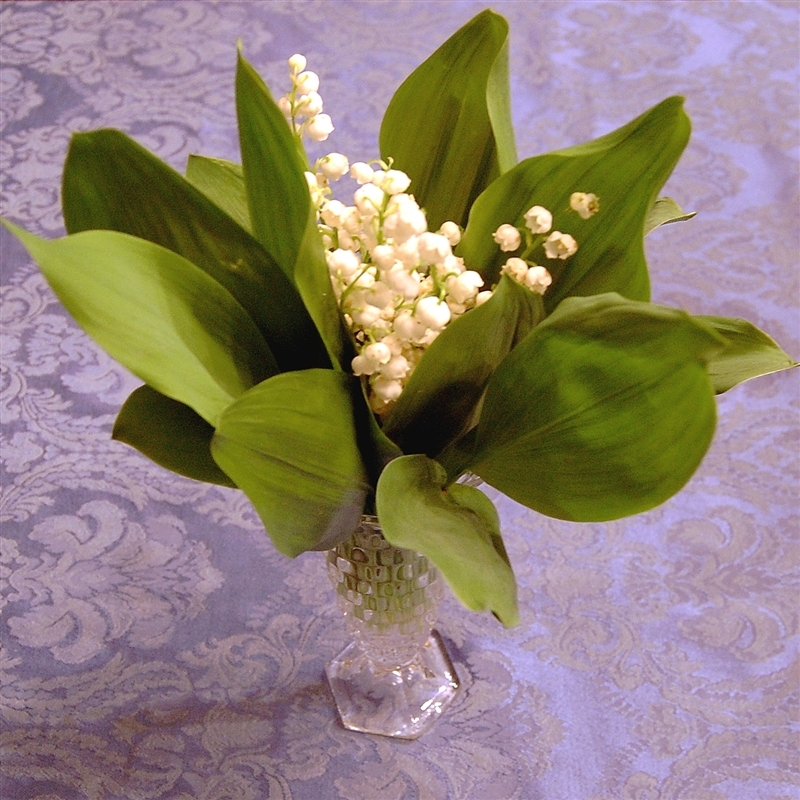 I have been "organizing my craft space and this certainly will help, Thank you for sharing Diane... Those lillies are very pretty, I am glad for you that you had a lovely Mother's day. I hope you have a lot of fun in your class this comming wknd, cannot wait to see what you share with us. Those flowers are beautiful! We have lilies of the valley at the top of the driveway, but last I checked they weren't looking great this year; I think the weather's just been too weird for them. What a nice blog friend to stand in line for you. It will be wonderful to meet her in person. I'm glad your Mother's Day was good. I got to do pretty much whatever I wanted and I chose to sand a piece of furniture that will go into my sewing room. Progress! I think this is a fantastic idea and just may do this for my TH inks and stains. I only have one question: what are you going to do with those three 1/4" strips??? Guess I am just a little OCD and need to know. I put the three strips on the other three sides of the ink pad so I can see the color no matter how it is sitting. 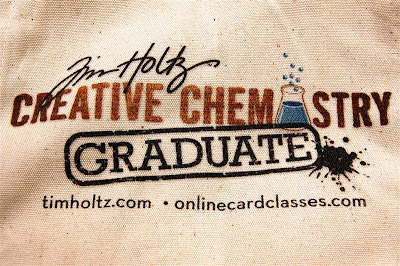 You can see the strip on the photo of the pad with the stain bottle. I must have missed that part of the explanation so I went back and edited the post. 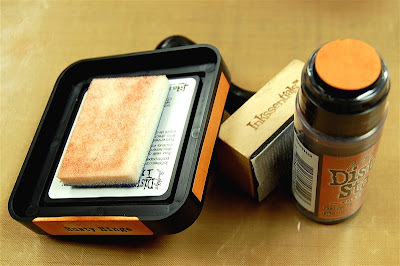 What a great idea to put the foam pads on the bottoms of the ink pads, I will share this with my friends and hopefully do it with my inks. Looks like you had a fun weekend playing in your craft room. I planted my 50 flower pots for the front of the house and back deck. I love doing this every year. A lot of work but a summer of beauty.